منشی‌زاده, آرزو. (1391). انسان، شب، شهر؛ مروری بر جشن نور لیون. مجله علمی-ترویجی منظر, 4(21), 44-47. آرزو منشی‌زاده. "انسان، شب، شهر؛ مروری بر جشن نور لیون". 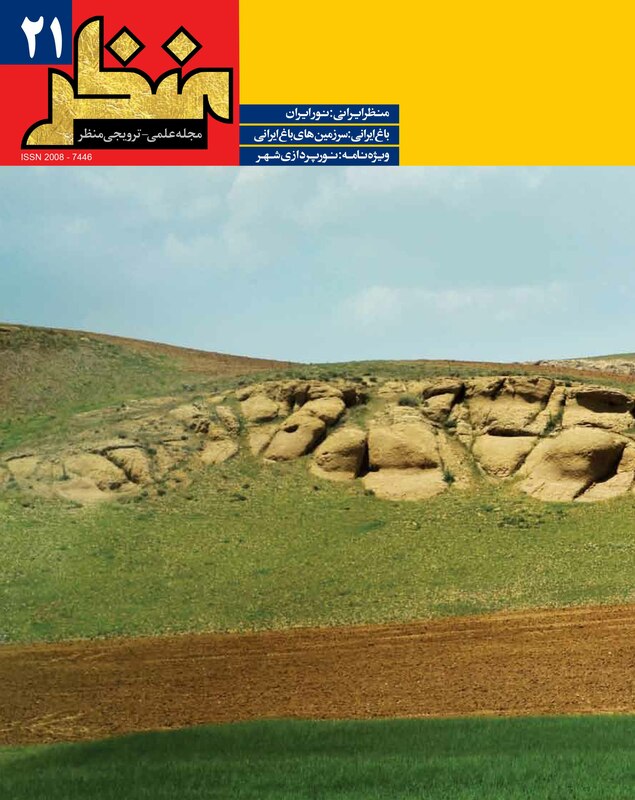 مجله علمی-ترویجی منظر, 4, 21, 1391, 44-47. منشی‌زاده, آرزو. (1391). 'انسان، شب، شهر؛ مروری بر جشن نور لیون', مجله علمی-ترویجی منظر, 4(21), pp. 44-47. منشی‌زاده, آرزو. انسان، شب، شهر؛ مروری بر جشن نور لیون. مجله علمی-ترویجی منظر, 1391; 4(21): 44-47. برگزاری رویدادهایی در مقیاس‌های مختلف اجتماعی، فرهنگی و مذهبی بصورت سالانه یا به مناسبت‌های مختلف همچون اعیاد ملی، بزرگداشت و یادبودها با تجمعات متمرکز یا پراکنده در سطح شهرها یکی از عوامل پویایی و سرزندگی فضاهای شهری است که تأثیرات کالبدی و اجتماعی قابل توجهی بر فضاهای شهری می‌گذارد. از جملة این رویدادها جشن‌هایی با موضوعیت نور و روشنایی است که به صورت سالانه و خود جوش یا تحت نظارت مدیریت شهری در چندین نقطة جغرافیایی جهان برگزار می‌شود. شهر لیون که یکی از چند شهر اول فرانسه شناخته می‌شود، امروزه با میزبانی بین‌المللی جشن نور (Fête des lumières)و با عنوان پایتخت نور به استقبال پروژه‌های هنری و نوآور در زمینه نورپردازی می‌رود. در چهار روز آخرین ماه سال میلادی، نور به عنوان یکی از اجزای اصلی فضای شهری، در شب، زمانی که طراحی هنرمندانه نور و روشنایی می‌تواند ارزش معماری و یادمانی بناها و مبلمان شهری را دوچندان کند، ایفای نقش می‌کند. این نوشته، با نگاهی به جشن‌های نور در جهان و سابقه تاریخی آنها، بر جشن نور لیون، مدیریت شهری و سیاست‌های طراحی آن جهت تقویت حضور شهروندان در فضاهای شهری متمرکز می‌شود. Ph.D. in Architecture, Grenoble University, Grenoble, France. One of the factors of vitality in urban spaces is the national and memorial events that occur frequently or yearly in public spaces around the world. This phenomenon has an impact on the form and type of people interaction with urban spaces which are not merely physical or formal. The example of annual festivals with a particular concept like light, can be considered in this discussion. With a glance at some lights festivals in the world: Diwali (India), Saint-lucie (Scandinavia), Festival of lights (Europe), fire festivals (Iran), this article is focused on Lyon’s Festival of lights (Fete des Lumières) and urban management strategies to improve the quality of citizens participation. The city of Lyon that is named today the capital of light, hosts yearly the creative and artistic lighting projects to continue a traditional event which dares backs to 1852. In four days of December, this celebration of light unveils the architectural elements of the city, through the illuminating of monuments, streets, hills and river banks. The municipality of Lyon’s participation in this event began in 1989 in such way that the Festival of Lights has now evolved into a major tourist attraction. The article approach is interested particularly in how the urban management strategies have developed the festival from a local scale to an international event. For example the festival organizer, yearly invites the different cultures to present their traditional ceremonies, or beside the professional projects, hosts the amatory projects and allows students from schools of art, architecture, design and engineers to practice their ideas and creativities. From the social view, this event could activate local communities and build a common sense of affiliation to restore local customs and traditions. It also offers the habitats sensory experiences which differ from everyday routine. Traditionally the Lyon’s habitats still illuminate little lights (“des lumignons”) on their windowsills and balconies. The light is still a symbol of hope and youth in dark nights of winter, but is no longer just for security and illumination, it has become more and more an essential component of the urban landscape, one that reveals the city’s texture without denaturing them and gathers the people interactively in urban space. Though, there are some critical points about augmentation of commercial aspects to tourist attraction, insufficient ways to economize the energy consummation, forgetting its origin, it seems that this festival inspired from a traditional event and supported by the municipality, have improved the people relation with urban spaces where light can act as an urban image device and a unifying element in city.